I’ve always wanted to try rock climbing but it’s just one of those things I never got to do. I never expected it, but I instantly fell in love during my first climb. There’s a certain sense of fulfillment looking at the panoramic views from up there, no matter where you’re climbing. You feel like you’ve worked so hard just to have that brief glimpse of paradise from a bird’s eye perspective. It’s one of the most exhilarating things I’ve ever done! My first rock climbing experience was almost accidental. In the middle of a three day Castaway booze cruise in Ha Long Bay, I got tired of partying. “I’m too old for this sh*t!” was the constant thought in my head. So even with a slight hangover I signed up for rock climbing that day, $30 for half day climbing with all the equipment you’ll need - climbing shoes, harness, helmet, rope, boat transfers and of course the instructor’s fee. After feasting on a sumptuous buffet lunch, we were picked up by our local Thai guide simply named “T” with a small local boat and brought us to the old Castaway island. The breathtaking limestone formations in Ha Long Bay seemed to calm my nerves. After what seemed like fifteen minutes speeding through emerald green waters, we finally reached the deserted island. On the right side was a gorgeous towering limestone wall. My two new French friends Emmanuel, Stephane and I patiently waited for our guides to set up the two different routes, both about 30 meters high, probably a 5b and 5c level of difficulty. I honestly thought I wouldn’t be able to climb that much but I took my time figuring out where to strategically place my hands and feet. I reminded myself to trust my harness, breathe calmly and surprisingly, I made it all the way to the top of both routes. When I reached ground level I lay flat on the sand like a starfish, completely exhilarated and exhausted at the same time. “WHY HAVEN’T I DONE THIS BEFORE?! ?” I asked myself, regretting that I didn’t start much earlier in life. I was so glad I chose to do it inspite of the wave of nervousness and fear I felt on the boat. I couldn’t wait to do it all over again. It simply felt like yoga on the rocks, only at the end your Savasana is a spectacular panoramic view only very few people are rewarded with. I found the only rock climbing company in the sleepy riverside town of Kampot in the south of Cambodia. I quickly signed up for a half day program for $35 that includes equipment and guiding (additional $5 for rock climbing shoes). 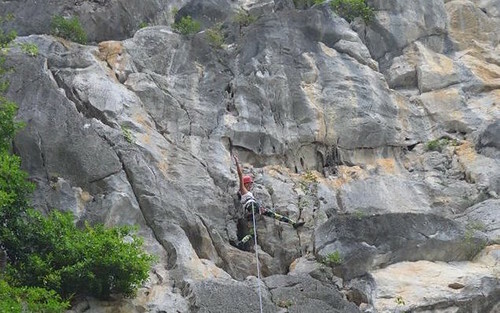 What I didn’t expect was that it offers other fun activities such as caving, abseiling or rappelling and via ferrata. David, the owner and operator of Climbodia discovered these caves a few years back and have been operating the adventure tours ever since. He prefers to meet up with the participants the night before the program so that he can thoroughly explain what to expect. After gearing up, complete with a torch around our helmets, we ventured into the deepest, darkest corners of the cave. Some parts were so low, we literally had to crawl to get through. There were incredible rock formations and ancient Buddha paintings by monks on the walls. 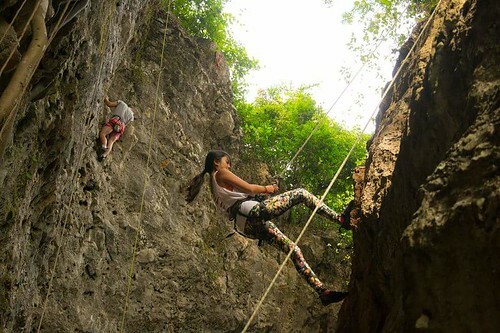 We attached our harnesses to a steel cable, or via ferrata to safely trek the outside jagged perimeter of the cave and after walked through a lush vegetable plantation. 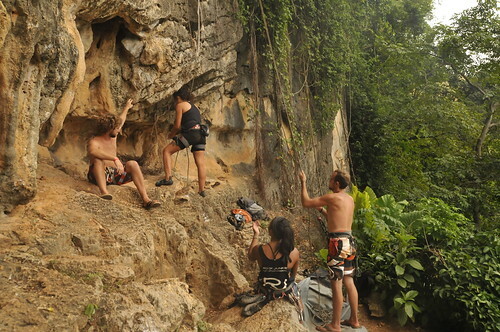 After the caving part, we finally got to try some rock climbing, a very easy climb for beginners but with a rewarding view of Kampot. To reach the abseil point, we again had to do via ferrata to trek to the other end of the rocky mountain. From there you can slowly descend 30 meters down to access the more intermediate rock climbing routes up to 7a+ level of difficulty. They promote it as a half day course but we were there for a good 6 hours. Such a great way to explore the countryside of Cambodia and really worth your time and money! 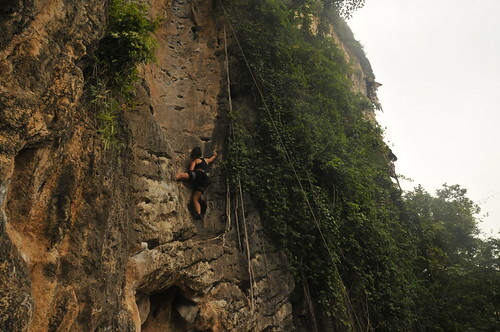 Rock climbing here is the cheapest in Asia! 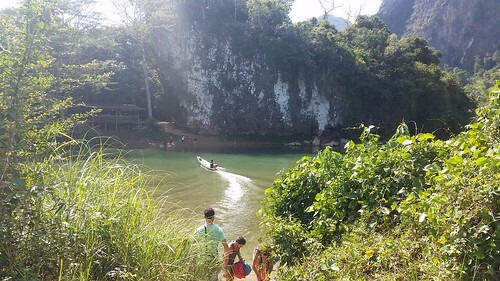 I was pleased to find out that the rates are almost half of what I would pay anywhere else in Southeast Asia, so I took advantage of that and climbed most days in Vang Vieng. The river water was too freezing cold for tubing anyway! There are a number of reputable operators in town but I chose to climb with Adam’s Climbing School. Adam, a Lao local used to work as a rock climbing guide in Germany. They are the first company to set up bolts around the area as well. At 9 am, we would all meet up at their office to gear up, go on the back of a beat up pick-up truck and ride a narrow canoe through the river to reach Sleeping Wall and Sleeping Cave. They teach you basic equipment use, climbing techniques as well as top-rope climbing, belaying and important safety measures. For independent climbers, you can rent equipment from most of the operators. There is a small fee to use the routes in and around the cave. If you’d like to warm up before your climb, you can actually reach this cave by walking along the rice fields for about 20 minutes so no need to take a tuk-tuk and a canoe! Bring a picnic lunch so you can stay the whole day. As you walk back home, watch the sun set behind those magical mountains. 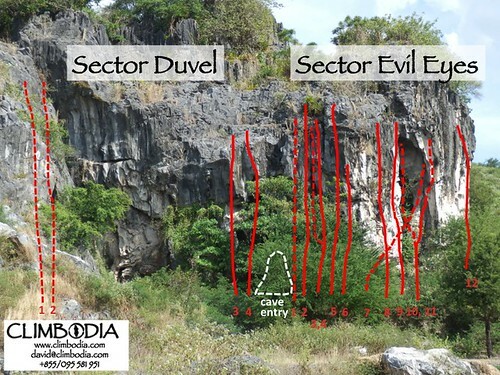 Tonsai is simply rock climbing heaven! Climbers from all over the world meet up on this idyllic paradise every year. Though recently, a multinational company has shown interest in building a massive hotel complex here. Sadly, all the smaller, locally owned businesses on the beachfront have been evicted last year because of this development. 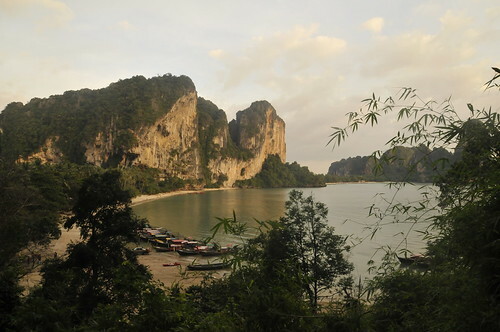 Even with the somber mood, I still wanted to spend my last two weeks in Thailand on this secluded paradise. At this point, I felt like I was ready to learn more and improve on my skills so I signed up with Basecamp Tonsai’s 301- Basic Climbing Skills three day course. 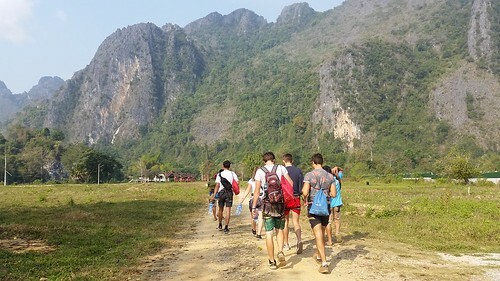 All the equipment you’ll ever need is included in the fee of 6,000 THB (around 177 USD) as well as an old guidebook and a textbook illustrating the basics of rock climbing. They were very flexible with the schedule, so if you needed to rest after a whole day of climbing (or a hectic night of drinking), you can actually take a week to finish the course. Unfortunately, I opted not to do the last day of the course because I felt like my local rock climbing instructor was not English proficient enough to teach me all the technical details of lead climbing and topping up. My life depended on these instructions and I didn’t want to take the risk of miscommunication while I was 30 meters up high. Thankfully I found fifteen Singaporean kids, some are members of the national climbing team. I tagged along wherever they went for the rest of the week. Even though they climbed routes that were so much more advanced, I learned a lot just from watching them have so much fun! -Most countries in Southeast Asia use the French Grading System. -Do not climb when you are too hungover! Climbing is a mental and physical sport that needs 100% of your presence. -Wear comfortable clothes. I suggest some light leggings and a tank top for women. Prepare to sweat a lot! -Do not climb in a dress, unless you want everyone to your see your underwear! -Trim your fingernails and toenails short before climbing. Longer nails may hurt. -Rock climbing shoes are supposed to be tight, but not too painful for beginners. -If you are renting shoes, wear thin socks to protect your feet from bacteria and avoid possible skin infections. -Wear a helmet especially during your first few times. You’ll be surprised how easily you can bump your head on overhanging rocks. -Choose your equipment well and check for any damages before using. -Trust your rope and harness! Note: No sponsorships here, I paid for everything. Very nice guide! We are amateur Filipino rock climbers, but we've never been to these places. We were only able to climb a handful of crags in our country. Obviously, we have never tried climbing these beautiful crags! 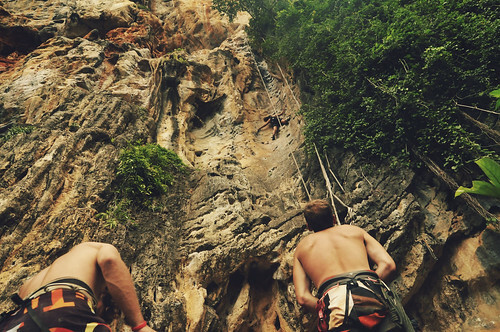 These rock climbing destinations should be in our bucket list!